Did you know that we provide training for volunteers that prepares them for tutoring in many Adult Basic Education Contexts? Learn more about the workshops we offer on our training page. To view the curriculum units and lesson plans continue scrolling to the end of this page. This six-month literacy skills-based curriculum was created with a grant from the St. Paul Community Literacy Consortium (SPCLC) in order to equip Beginning ESL learners with not only English language, but Transitions skills to build foundations for work and acacemic pathways. Each unit incorporates Transitions skills from the framework developed by the Hamline ABE Teaching and Learning Advancement System (ATLAS) Academic, Career & Employability (ACES) framework. Each unit also builds CASAS competencies and systematically develops print concepts, phonological awareness, phonics, word recognition, fluency, and comprehension. This six-month life skill curriculum was created with a grant from the St. Paul Community Literacy Consortium (SPCLC) in order to equip Beginning ESL learners with not only English language, but Transitions skills to build foundations for work and acacemic pathways. Each unit is CASAS assessment-aligned, incorporates Transitions skills from the framework developed by the Hamline ABE Teaching and Learning Advancement System (ATLAS) Academic, Career & Employability (ACES) framework. 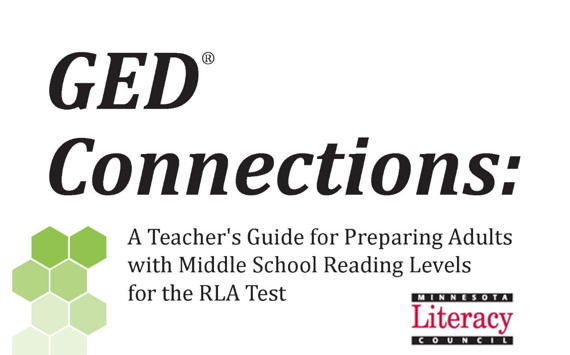 This unique and comprehensive teaching guide is designed for adults with a middle school reading level who are studying for the Reading and Language Arts GED® test. The guide aligns to both the GED® Assessment Targets and the College and Career Readiness Standards. The seven modules in the guide are organized around high interest thematic social studies and science topics and each module takes approximately two the three months to complete. Students will read closely, think critically, and make intertextual connections in discussions and writing. The guide is designed to accommodate adult learners who may not be able to attend every class and is suitable for use with advanced English language learners. The unit features 50 lessons divided into four units which represent the mathematical concepts covered in the GED Math subject test (including number sense, geometric and algebraic thinking, and data measurement and analysis). Lessons include examples, demonstrations and some videos which aid instruction as well as practice materials for students to complete in class and as homework. The curriculum is designed to present GED-level math both conceptually and contextually; basic math is not included. The curriculum features 47 lessons divided into three units which represent the areas of scientific study covered in the GED Science subject test (Earth and Space Science, Life Science and Physical Science). Another small unit includes a lesson on the Scientific Method and corresponding classroom experiment lesson. An overview of the curriculum and extra lesson on probability and scientific notation on the GED Science exam are also provided, along with a menu of videos included in the lessons. The Minnesota Literacy Council created these curricula in partnership with ECHO (Emergency, Community, Health, and Outreach). The goal of these curricula is for learners to become familiar with the resources and responsbiliites related to these important health and life skills topics. We invite you to adapt them for your own classrooms. Open Door- Northeast Learning Center participates in a Pen Pal Project in which learners are paired with volunteers who are employed at Thomson Reuters in Egan, Minnesota. This two day unit introduces learners to the project and prepares them to write introductory letters to their new pen pals. 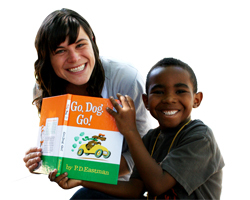 This lesson plan can be used with ESL learners at the Intermediate level or above. In this lesson, learners navigate the Minnesota Literacy Council's Hotline database to find free ABE and ESL classes throughout the state. The Hotline database is user-friendly and easy to navigate. You can find it at mnliteracy.org under Find Free Adult Classes. These lessons help student pratice skills needed on the standarized CASAS tests. In these lessons, students develop skills in reading, writing, speaking and critical thinking while they learn about a significant facet of life in the United States – voting and elections. All lessons include an original story, related vocabulary, a worksheet with questions for discussion, an activity, and relevant information for the instructor. Each lesson takes 15-25 minutes, depending upon discussion time. Links are provided to websites for more information on the election process and candidate information. Pre-registration forms are included and absentee ballots may be downloaded; websites are included.